It's perhaps contradictory for a singer to have been in a pop band similar to the Spice girls, and then to become one of the support artists on the latest Peter Gabriel tour. But the musical career of Sevara Nazarkhan is one of the most eclectic in Central Asia. Born in a family of musicians (her mother was a music teacher and her father promoted traditional uzbek music in Radio Taskent) Sevara studied singing and etnomusicology in the Conservatory of Uzbekistan. 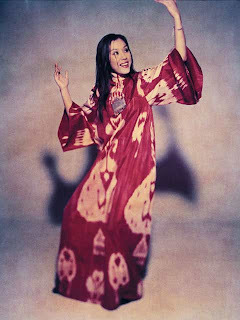 In 2004, she won the BBC Radio 3 Awards for World Music, as the best artists of Asia-Pacific. Her abilities with ancient persian instruments like the Dutar and her style, between pop and traditional uzbek music make her a rare but nice mix to our ears.